We're proud to present the first in our meet the blogger series. We spend a lot of time reading your blogs, and we're impressed with all the inspiration out there. That's when we decided we had to get to know a few a little better. In the first one we spoke to Jazmine from Jazzabelles Diary. Ok, first up who is Jazzabelle? Jazzabelle is a eighteen year old art student from London, who spends her days rummaging in charity shops and car boot sales, spending time alone, sitting in cafes and visiting the Victoria and Albert Museum. How long have you been blogging, what made you want start it in the first place? I've been blogging since March, so I still feel like I'm relatively new to the 'blogging world'! I decided to start my blog after attending the member's preview of the previous Quilts 1700 - 2010 exhibition at the Victoria and Albert Museum, I was just so inspired by many of the pieces on display that I really wanted to write about it. I then decided that my blog would be a great place for me to share my charity shop finds, personal style and my day to day life. What inspires your blog posts? To be honest nothing really inspires my blog posts, because as I write in somewhat of a diary format I just tend to post if I'm in the mood or I feel I have something worthwhile to share with everyone who reads my blog. Though style-wise, I am very inspired by the way other bloggers dress, I can't believe my style has changed so much since I started blogging! How would you describe your style? I find it hard to describe my style, but I think it is rather simple, yet eclectic. I tend to stick to more neutral tones and can usually be found wearing a secondhand grandad jumper, chunky scarf, jeans and my favourite leather Topshop boots. I think I'm quite androgynous in the way that I dress, though I'm hoping to start introducing some more femininity and girliness into my outfits in the future. What three items can you not live without? My camera, kettle and of course my lovely hobo jumper! 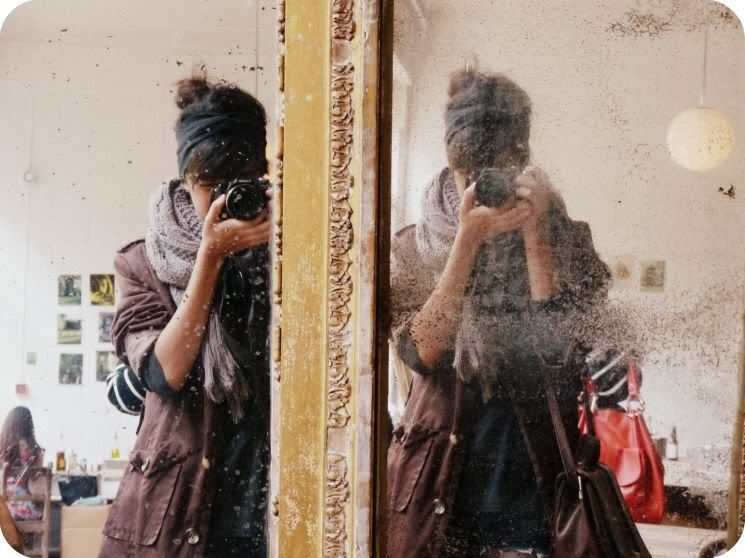 On your blog you wear a lot of items from Charity shops, do you have any tips? My main tip is to make sure you frequently visit your local charity shops and always have a good rummage, beecause as stock changes daily one day you might leave empty handed, but the next day you will find some unbelivable bargains! I'd also recommend that you get to know the people that work in the charity shops, strike up converstations and donate your old stuff to them, that way they start to know your personal style and point out pieces you like, hold stuff back for you and even give you discounts! What do you get up to when you're not blogging? When I'm not blogging, I spend my days visiting museums and exhibitions, studying for my Foundation Diploma in Art and Design, secondhand shopping, volunteering in my local charity shop, working with a youth group called CreateVoice at the Victoria and Albert Museum and with family. I'm quite a simple person, really, who enjoys the simple things in life. Tell us something no one else knows about you... I was once in a television advert when I was younger, I think it was for meningitis awareness. I was only in it for a split second, though, as apparently my pink dress was too bright, so I had to stay in the background, haha! And lastly as we've just released out Autumn issue, what's your favourite thing about Autumn? Ohh, so many things! Autumn and Winter are my favourite seasons, it's always so much more nostalgic for me than Spring and Summer. I adore how beautiful the leaves look, the 'back to school' feeling, the perfect weather for layering clothes, the fact that Christmas is around the corner and of course it's when Starbucks realises their christmassy red cups! This is such a lovely interview. The girl is simply amazing!!! I just watched her video blog earlier and she is just so sweet. Great interview and great girl! such a good interview! This girl is amazing!